DSL, short for Digital Subscriber Line, is the second-most popular type of internet service after cable in the US. It’s one of the oldest forms of consumer broadband internet and relies on the telephone network to deliver internet. DSL is also sometimes referred to as „ADSL“, the ‚A‘ standing for „asymmetric“. This simply refers to the fact that the download bandwidth is larger than the upload bandwidth. The two abbreviations are more or less used interchangeably nowadays. Fiber optic cable internet, or just „fiber“, for short, is the fastest consumer internet service available in the United States. Fiber optic cable uses pulses of light instead of electronic signals over metal wire to transfer information. While fiber direct to the home makes up a small portion of internet subscriptions today, fiber infrastructure is expanding quickly. Fiber is often used to deliver internet to neighborhood nodes, where it is then split to individual households that subscribe to cable internet over optical coaxial cable. It is immune to the downfalls of ADSL and standard cable internet, such as electromagnetic interference and long distance signal degradation. In addition to internet, fiber is used to deliver cable TV and telephone (VoIP) services. After price, speed is probably the next priority for many prospective subscribers. Generally speaking, internet speed governs how quickly you can download and upload files, how much latency or „lag“ you experience, and the quality and time spent buffering streaming video. First of all, always keep an eye out for the „up to“ or „maximum“ preceding the number in fine print. 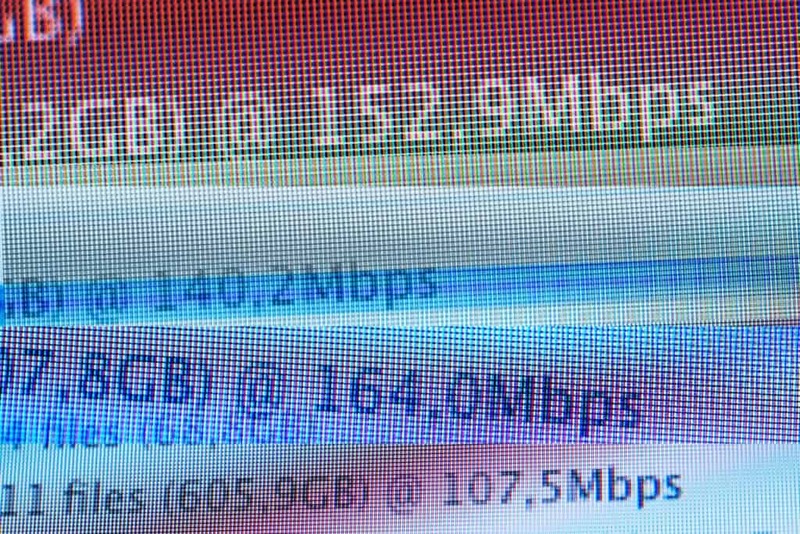 Depending on network congestion–how many other people are connected to the same cables as you and sucking up the shared bandwidth–you likely won’t get speeds that fast all of the time. If you’re on a particularly congested network, internet speeds can drop to just a fraction of the advertised download rate. It could well be that the only time you’ll get your full 20 Mbps is at 3 a.m. on a Tuesday. Secondly, ISPs count on most of their customers being ignorant of the difference between bits and bytes. Bits are denoted with a lower-case ‚b‘, and bytes with an upper-case ‚B‘. Without getting too technical, just know that a byte is made up of eight bits, so 1 MB is eight times the size of 1 Mb. Latency is also referred to as „ping time“ or „lag“. Online gamers and video chat users can be affected by latency, as there will be a delay between their actions and what they see or hear on screen. Distance from nearest internet exchange point – Internet exchanges, also called broadband exchanges, are central points where ISPs and content delivery networks (CDNs) interconnect. Think of it as a central train station in a major city that acts as a hub. Your internet traffic travels on your ISP’s network until it reaches one of these central hubs. If you live far away from one of these hubs, your internet speed might be reduced. This is especially true for DSL customers, whose internet is affected by „noise“, or interference. DSL customers should be aware of their distance to the nearest broadband exchange and/or access multiplexer. Another, less well-defined practice relating to net neutrality is called zero rating. Zero rating generally means that an ISP won’t count the data used by a certain service against their customers‘ data limit. For example, if Verizon creates or acquires a Skype competitor, zero rating would allow customers to use its own service without racking up data, whereas Skype users would still have to keep an eye on how much data they use. When it comes to large American ISPs, the answer to that first question is almost undoubtedly: Yes. Your ISP keeps a record of your internet activity. Smaller ISPs also likely keep a record. These records are sometimes referred to as „logs“. Until recently, these ads were limited to ISPs‘ internal advertising networks. 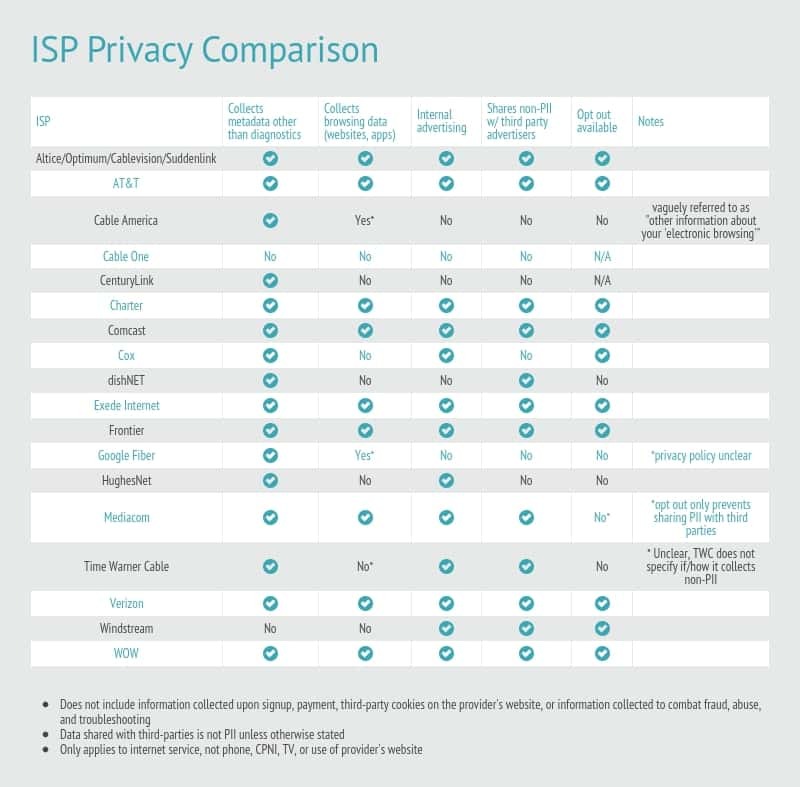 Both the ISP itself and third parties display ads on web services owned by the ISP, such as the ISP’s website, based on the information they collect. They can also send you targeted promotions or advertisements in emails. Finally, US ISPs recently rolled back privacy regulations that prevented them from selling your browsing data to third parties. Despite an outcry from consumer and privacy advocates, ISPs can now sell users‘ traffic content and metadata to whomever it wishes, typically third-party advertising networks. It’s important to note, however, that even though many media outlets have framed this repeal of regulation as a means for your ISP to sell an individual’s browsing history to the highest bidder, that’s not exactly how it works. Your personally identifiable information (PII) is still protected under the Cable Communications Policy Act of 1984. Personally identifiable information includes any information that someone could use to identify or contact you. Instead, information from your browsing history is „de-identified“ so it is not directly tied to you. It is then supplied to advertising networks to target users with interest-based ads. But even though that data might not identify you as a person, personally-identifiable information can still target your specific device through the use of an IP or MAC address. These identifiers and others are not considered PII. Concerns also arise if a data breach occurs and hackers gain access to users‘ browsing histories, or if law enforcement and intelligence agencies monitor those databases. The repeal of this regulation only occurred in 2017, so we’ve yet to see how ISPs will take advantage and how far they will actually go when it comes to invading their users‘ privacy. Some ISPs have pledged not to sell customers‘ individual browsing data that includes PII, but this is somewhat of an empty promise since they are still lawfully barred from doing so according to the Cable Communications Policy Act. There are several reasons to consider buying and installing your own modem and router rather than using your ISP’s unit. Your ISP might be charging you a rental fee for these devices. Using your own setup will give you more control and flexibility when it comes to configuration. You may need stronger signal strength, a more reliable connection, or faster speeds than what your ISP’s router or modem allow. Using your own devices can give you greater privacy and help prevent ISP snooping. Finally, some ISPs allow customers to use each others‘ wifi networks, which mean strangers could eat up your bandwidth and introduce security issues onto your network.